The dramatic increase in antibiotic-resistant infections has created a pressing need for new and more efficacious antibiotics. An area that has garnered renewed interest is the development of antimicrobial peptides (AMPs) and proteins. AMPs are a distinctive class of potent, broad-spectrum antibiotics produced by the body’s innate immune system and act as the first line of defense against disease-causing microbes. By using natural AMPs as templates, our team has developed synthetic AMPs effective against a variety of microorganisms, including drug-resistant clinical isolates of Mycobacterium tuberculosis and Pseudomonas bacteria. Because AMPs are small, expensive to produce and labile in biological systems, our team also systematically evaluated various physically crosslinked hydrogel systems with strong electrostatic interactions with cationic peptides for effective loading and controlled drug release. Several developmental prospects and challenges will be highlighted in order for this unique class of therapeutics to emerge as integral tools for combating drug resistant infections. Dr Rachel P. L. Ee completed a PhD in Pharmaceutics at the College of Pharmacy, University of Illinois at Chicago. After her postdoctoral fellowship in the industry, Dr Ee returned to her alma mater as a faculty in the Department of Pharmacy, National University of Singapore (NUS). 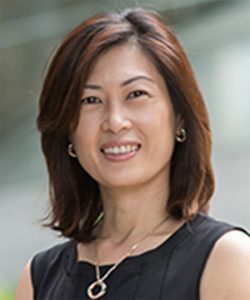 She is currently the Deputy Head (Research) as well as the Director of the new Pharmaceutical Science Programme in NUS. Her research is focused on the design and development of novel biotherapeutics and hydrogel formulations for the delivery of drugs, genes and cells. She received the Deutscher Akademischer Austausch Dienst (DAAD) Research Exchange Fellowship and UCLA-Banco Santander W30: Women Leaders in University Administration Program Award as recognition of her research and administrative excellence in 2014.